I just got back from a long morning walk with my dogs, and I am so excited about the weather we are having. It was 65 degrees! I was in a sweatshirt. Now that the dogs are walked, and coffee is made, it’s time to do a little Saturday morning blogging. A couple of nights ago, I put together a list of twenty-five new recipe ideas. My goal is to post two a week. I cook a lot more during the cooler months because the summer just makes it too hot to do anything in the kitchen. I’m excited about all of the recipes because the ingredients are in season, perfect combos, and some are inspired by dishes I’ve had at restaurants. 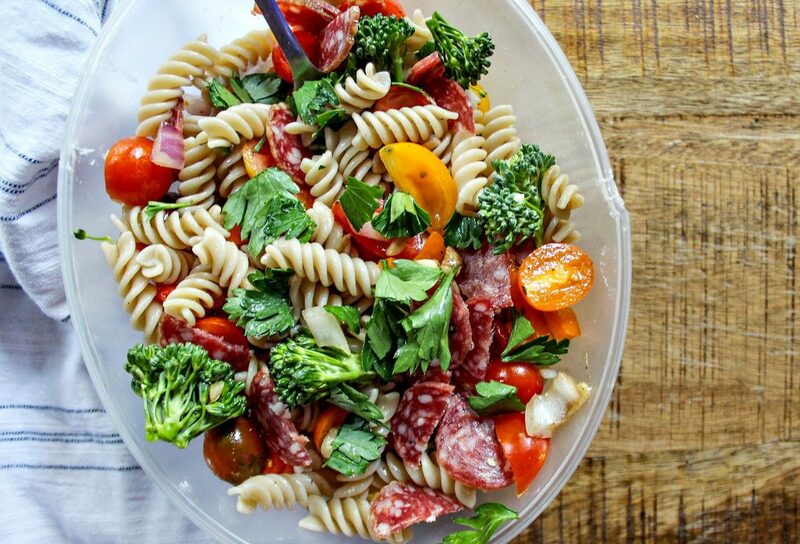 I decided to tackle #6 on the list of recipes, the Italian Pasta Salad. 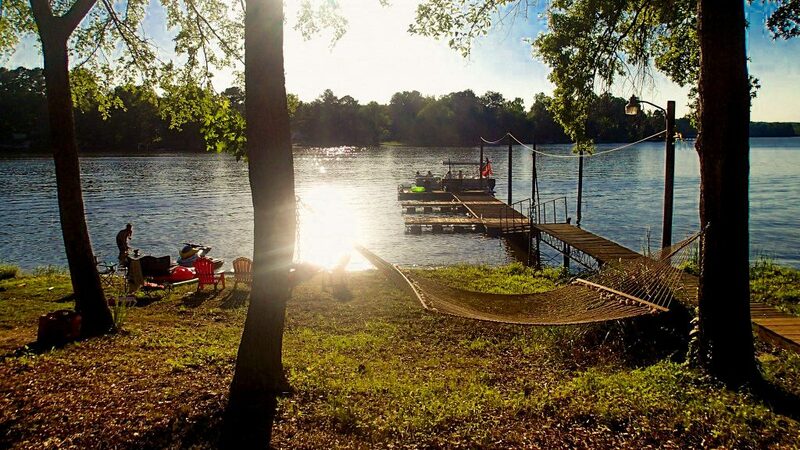 About three years ago, I spent one Memorial Day Weekend out at the lake. 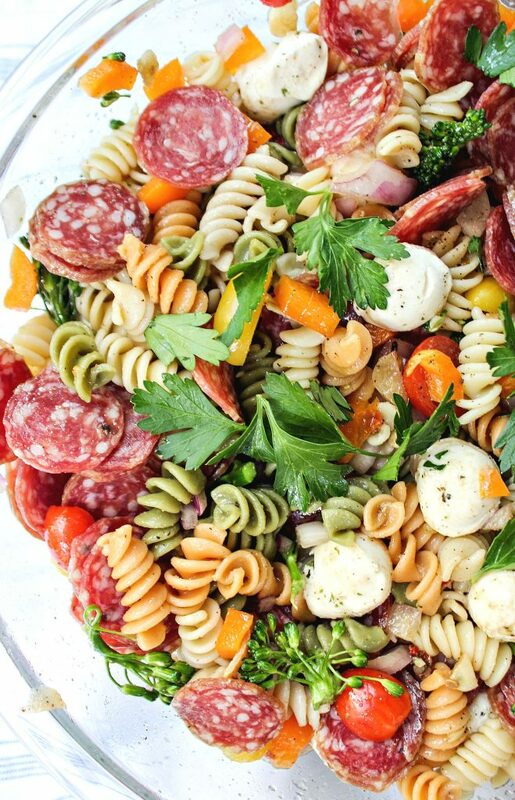 Someone brought this unforgettable cold Italian pasta salad. It was so yummy! 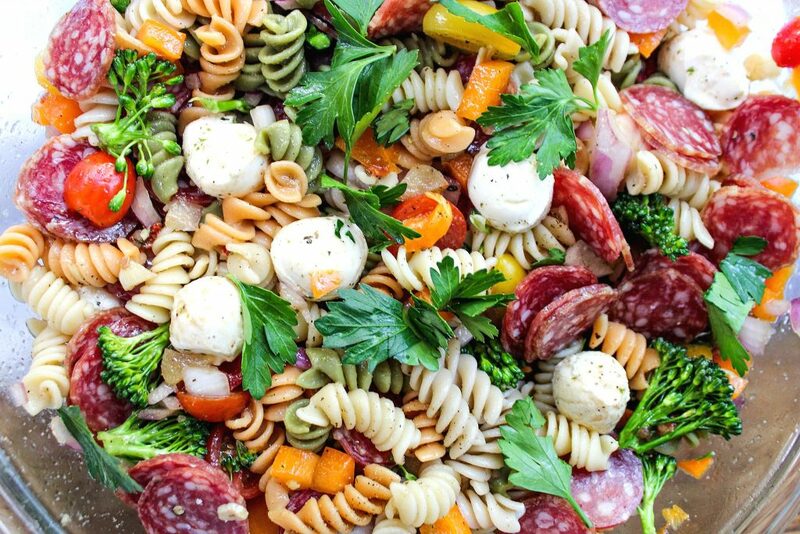 Because it’s Labor Day weekend and many of you will be attending BBQs and cooking at home, I wanted to share my version of the Italian Pasta Salad. I tried to recreate it the best I could, and I think I nailed it. Kyle surely thinks so! I changed up a few things and left out the olives, but you can totally add them in if you want to. I can’t wait to bring some over to my parent’s house before we play tennis later. Not only is this dish incredibly delicious. It’s gorgeous! It’s a beautiful dish to serve, and pretty quick to make! It’s also a great dish to bring to football tailgates this year. This can be made the night before and it tastes even better overnight! It has time to sit and marinate in the delicious garlic vinigrette. In a large pot, boil water & cook the pasta! While the pasta is cooking, heat a saucepan on low. Add olive oil, salt, pepper, and chopped garlic cloves. Allow the garlic cloves to slowly brown. Make sure the oil is not too hot, or it'll start to burn. 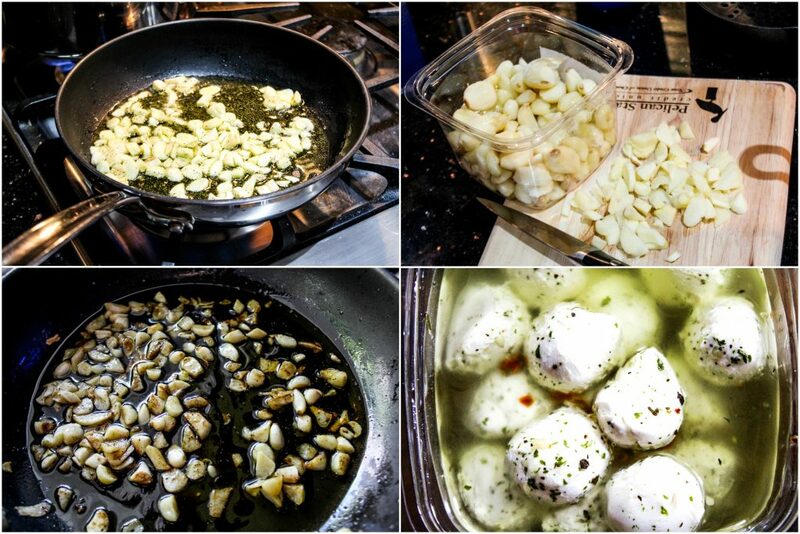 When the garlic is lightly brown, turn the heat off and remove from burner. Allow the pan to cool off. Once the garlic oil has cooled a bit, add balsamic, vinegar, and honey. Stir. Set aside. 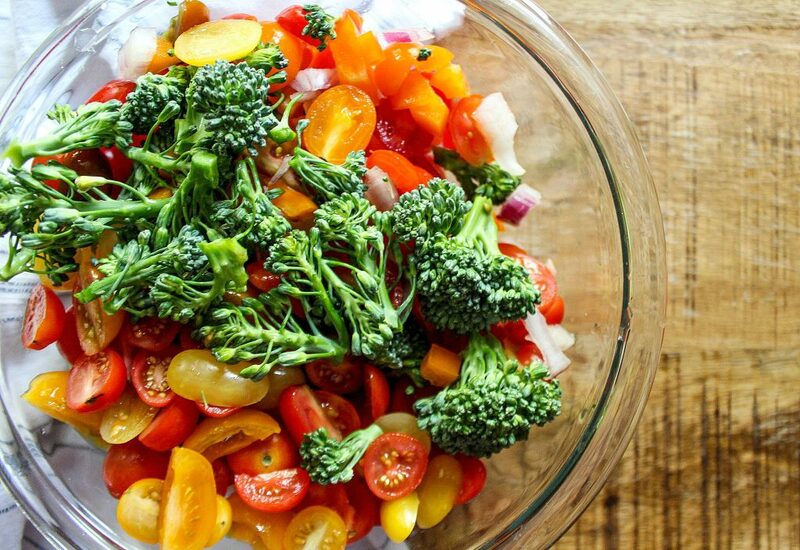 Halve the cherry tomatoes, dice the bell pepper and onions, remove the broccolini stems, chop the parsley, and add it to a mixing bowl. Season with salt and pepper. I also added some extra garlic powder on top. After draining and rinsing the pasta, add it to a large mixing bowl. Sprinkle black pepper, garlic powder, onion powder, and sea salt on top. 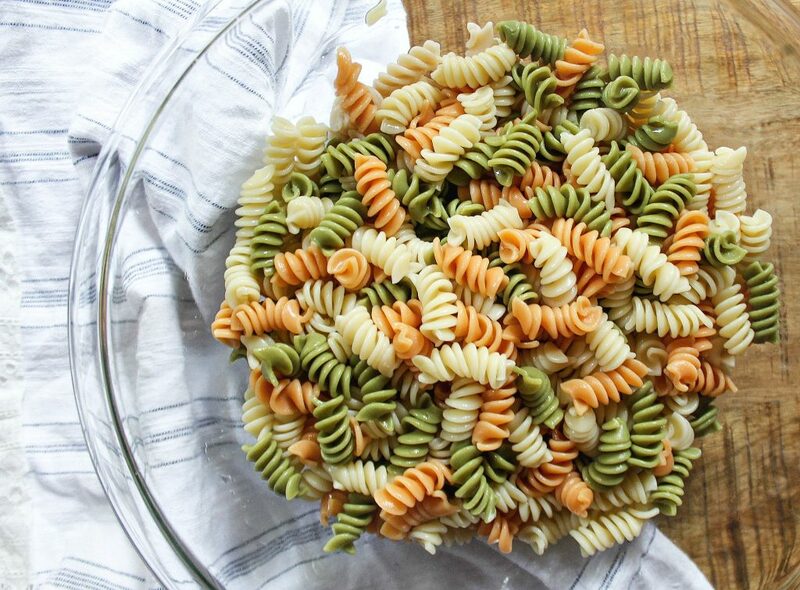 Add the vegetables to the bowl with the rotini. Pour the garlic vinaigrette on top and combine. Add a couple of tablespoons of water to the sauce pan to gather all the extra leftover flavor and add it to the dish. Add the mozzarella pearls and cured sausage and give it a light toss. Sprinkle a drizzle of olive oil and pepper on top to finish it off! You can easily make this dish gluten free and dairy free as well. I made a bowl without the cheese and used gluten free pasta. Looking for a vegan option? Exchange the meat and cheese for tofu! You can get creative with the ingredients. The original dish had used sharp cheddar, pepperoni, olives, and no veggies. I decided to add my own touch! A couple of years ago, I would never have touched a cherry tomato. I’d pick around them or leave them out of everything. I slowly started to love them by cooking them, trying them when they are in season, and now I crave them. You really can create tastes for certain foods. I don’t think I could do that with mushrooms though! If you want a quicker recipe, you can skip out on your own sauce and use a store-bought garlic vinaigrette for the dressing. I think the next time I make this recipe, I’m going to use a cheese-stuffed tortellini pasta. Sneaking in all of the vegetables brought a lot of flavor and color to the dish! If you want to take this recipe to the next level, you can add 1/4 cup of grated parmesan cheese and olives (if you like them) as well. 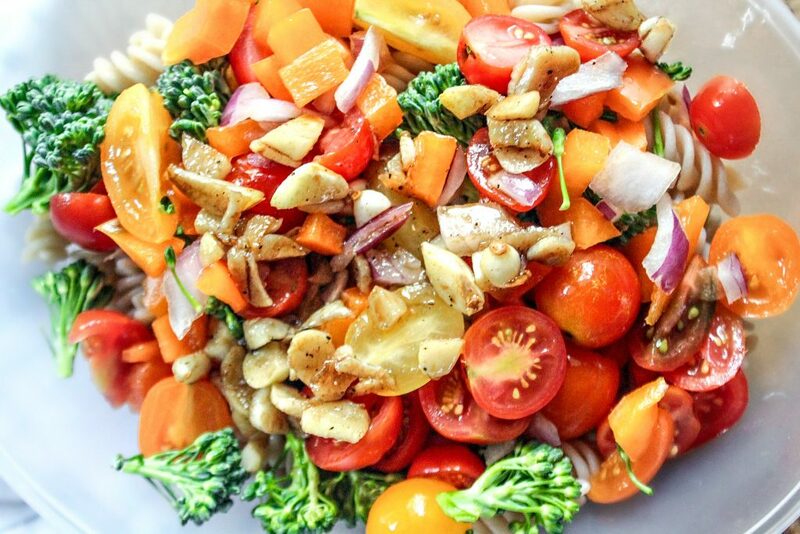 The smell of the garlic balsamic vinaigrette was mouthwatering. The first thing Kyle said when he got home was “what is the amazing smell, what are you cooking?” You can’t go wrong with roasted garlic! This would be a great side dish with grilled chicken. It has healthy carbs, fresh vegetables, protein, and more! I made a separate bowl with no cheese and gluten free pasta. Just to show you how easy it is to accommodate any diet with this recipe. I used a brown rice pasta from Fresh Market. If you replace the meat with a vegan meat/or tofu, you can also make it vegan. I promise you’ll have people wanting this recipe, or complimenting you on how beautiful it is! 🙂 This is one of those recipes you can make all year round and change up the ingredients depending on the season. I made this at my boyfriends house, and I don’t keep my cute food props here, so I used one of my shirts for the “napkin” look 😉 Gotta do what you gotta do! I am really excited to bring more recipes to the blog! This afternoon, I’m making healthy (sugar free/gluten free/dairy free/nut free) cinnamon apple pumpkin cupcakes with a coconut whipped frosting! Hope you have a wonderful Labor Day! 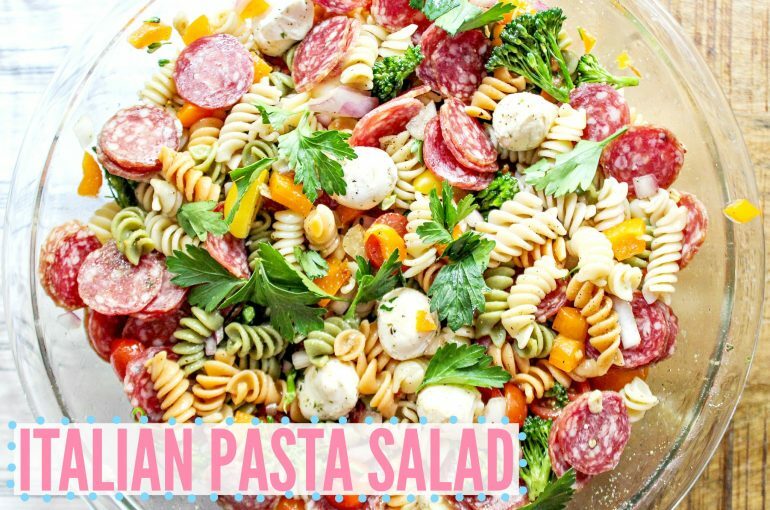 Have you ever made a cold pasta salad? What kind of recipes would you like to see on the blog? Who is ready for football season? We just made this and it’s SOOOO good!!! This looks so delicious!! 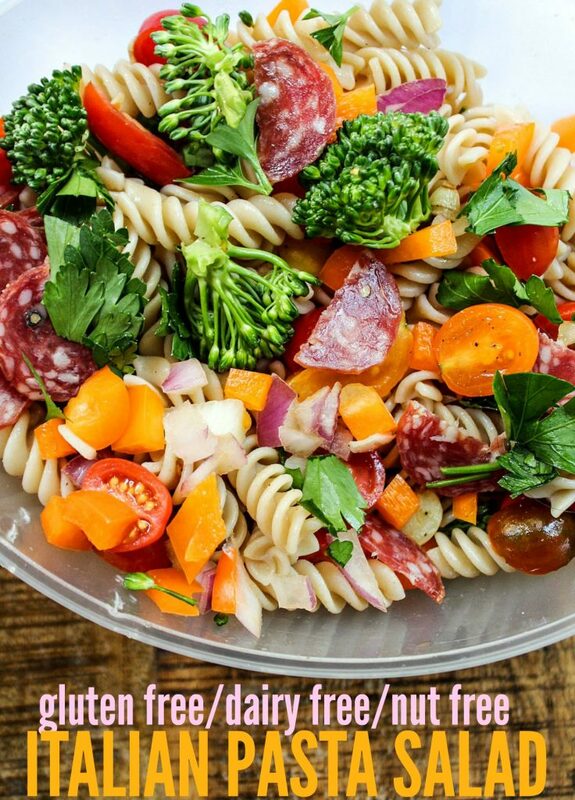 Love pasta salad! Thanks so much for sharing! Holy Crud. This was a great recipe! 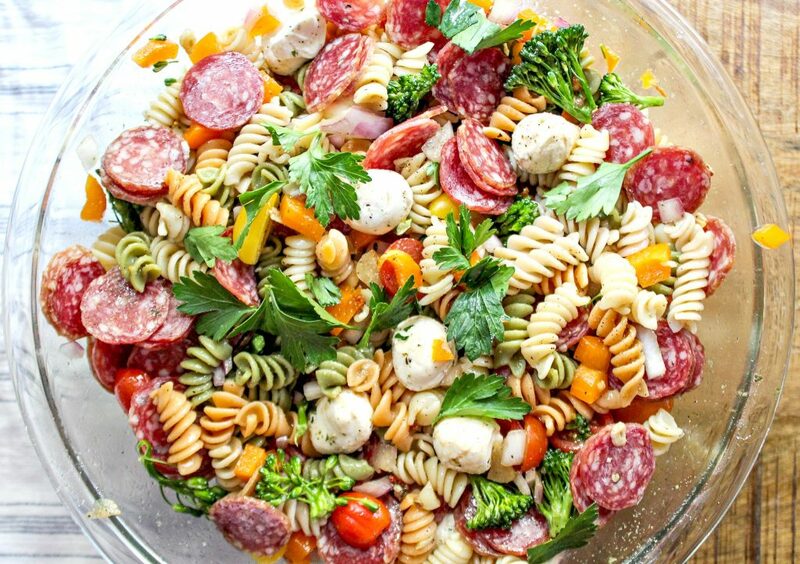 What a pretty pasta salad!! I was literally thinking how perfect it would be for end of summer BBQs and football tailgating! When I was young I always thought cold pasta was weird. But at some point I ‘grew up’ and now I love it! I can’t wait to try this recipe! So far I’ve LOVED all of the recipes that I’ve tried! So recipes of any kind! I find myself scanning your blog when I can’t decide what to make! I’d love some meal prep inspiration that could be good for lunches or dinners 😉 I also am always baking muffin/scones goodies in the winter to go with coffee so any recipes along those lines would surely become a quick favorite over here! This looks so good! And I love that you made it with NO olives!! Olives =? We made this for our BBQ last night! Wonderful. So happy you enjoyed it!!! Look at the colors! How pretty 🙂 I cannot wait to give it a try, Taralynn. Thank you for adding the gluten free and dairy free version. I’m loving all of the colors! Thank you 🙂 The rainbow tastes better! I love the idea of using your own dressing. I’m so grossed out by store bought dressings. It’s so easy to make and customize! I made this and added cheddar cheese, parm, olives, extra onions, and pepperoni! AWESOME! This looks fantastic! I’m a big fan of pretty much all salami and pepperoni, and I love the addition of fresh mozz. I would definitely try this one. You just won my Italian heart. YUM! 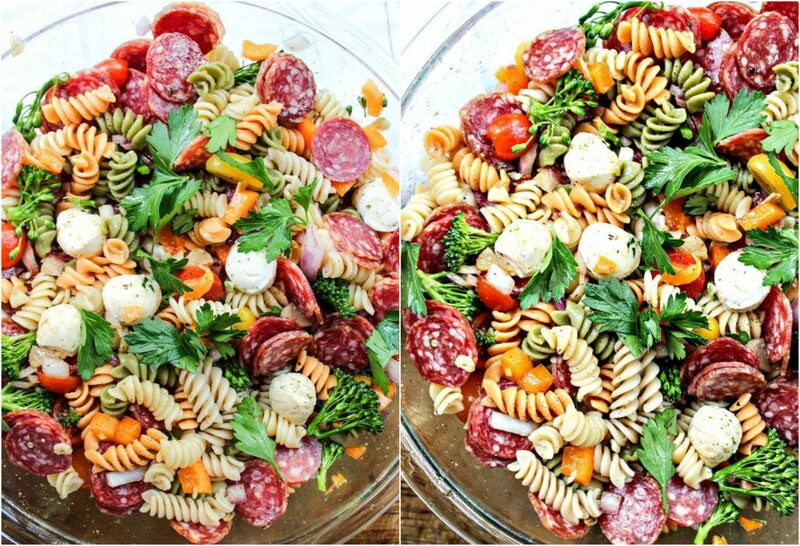 I love cold pasta salad, and the colors in this are gorgeous! Ben and I are the same with tomatoes. When we first started dating, you couldn’t have PAID us enough to eat them, now we’ll eat them plain! It still makes me feel very ‘grown up’ to be eating them though haha. I would love to see healthy baked goods, or easy veg dinner ideas. Sometimes I feel like I start making the same things over and over and it’s fun to spice it up! Oh, and pumpkin recipes, of course! Not sure if I’m more ready for football, or all the delicious noms that come along with watching the games :). Go Broncos! I don’t see it but where is the recipe for the vinaigrette? Sounds amazing and I’d love to try, thanks! That’s what you add to the mixture! I am running to the store to make this for our afternoon football tailgate! Don’t hate me, but I’ll be added olives! Hahaha it’s ok! I know many people love olives! 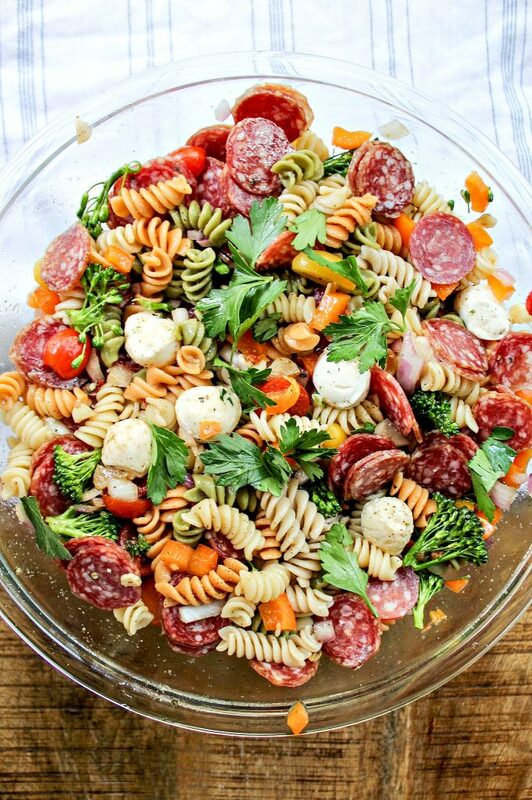 I love cold pasta salad, and this one looks beautiful! I would take out the meat, but other than that this looks perfect. I’m the same as you with cherry tomatoes and mushrooms. 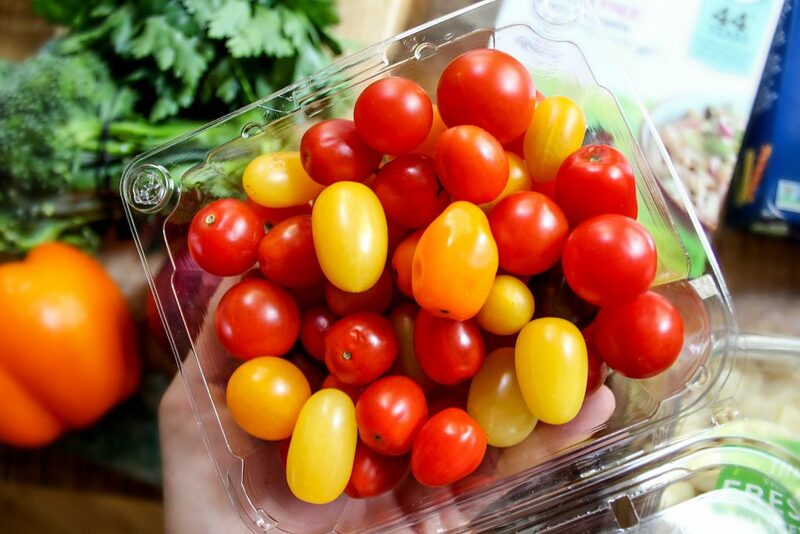 I used to hate cherry tomatoes but this year I’ craving them. Still can’t get myself to like mushrooms though. I think for me it’s a texture thing. When they’re raw they remind me of chewing on an ear, and when they’re cooked they remind me of chewing on a slug. 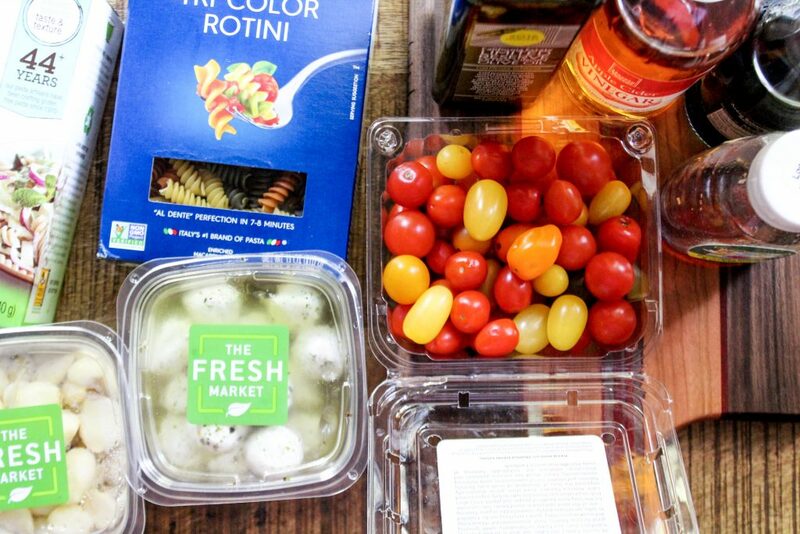 Maybe cherry tomatoes have changed, not us! lol I think this time of year, they taste better! Yeah, won’t even attempt mushrooms. Something my boyfriend would eat! Yay! 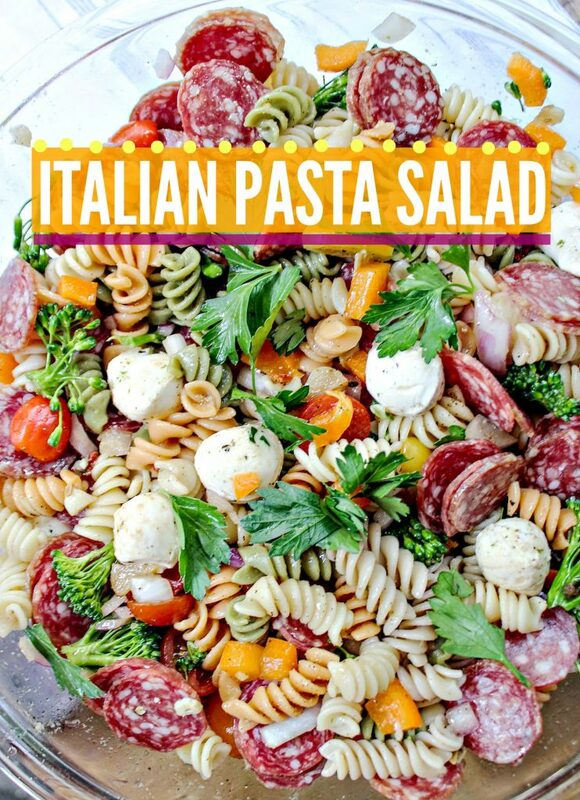 (he’s so picky) I’ll have to make this when we get back from our trip — I love pasta salads. This sounds SO delicious! I can’t wait to make this for the next BBQ/Tailgate I head to! And yes, I am SOOOOO glad football season is here! The best time of year! Hey Tara, what do you usually consider healthy? Lower fat? Lower sugars? Something else? 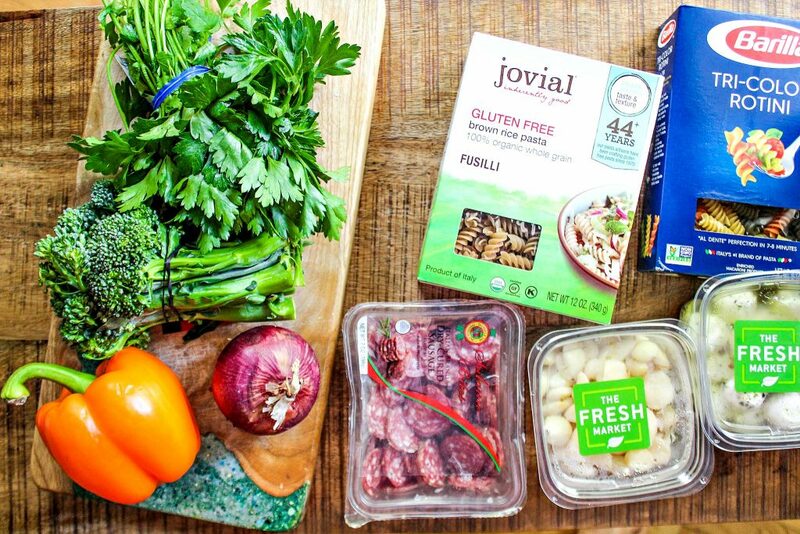 I’m curious as to what you generally look for when creating a healthy recipe. Yummm this looks great! I love how customizable it is. I’m thinking of swapping out the noodles for zucchini noodles and skipping the cheese to make it paleo ? Thanks for sharing! That would be so awesome! Let me know if you do it! :) Or you could even dice up summer squash and zucchini! 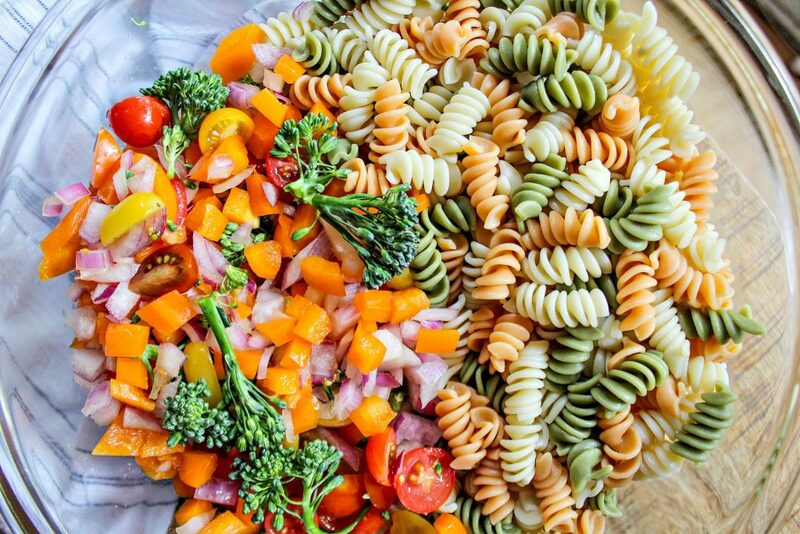 I don’t usually like pasta salads, but yours looks so colourful and delicious! Will give it a try next weekend! Exploring Greenville + Fitness & Food!